We had a really successful training on Saturday at the School District. We now have over 200 volunteers for the September 25th National Voter Registration Day event in the high schools. There is one more training this Thursday and then we’ll be ready to go. 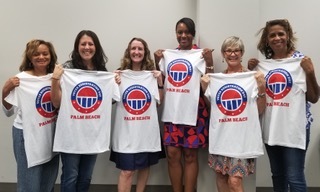 In the picture below: Judy Edwards, School Board Member Erica Whitfield, Assistant Superintendent for Teaching and Learning, Kalinthia Dillard, Pam Maldonado, LWVPBC Voter Services Chair, and Shawn Henderson. Judy Edwards, Shawn Henderson and Kalinthia Dillard represent the West Palm Beach Chapter of The Links, Inc. Ms. Dillard is President of the chapter.